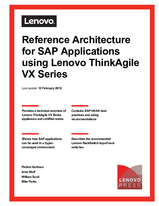 This document describes the reference architecture for SAP application workloads using the Lenovo ThinkAgile VX appliances and certified nodes. The intended audience for this document is technical IT architects, system administrators, and managers who are interested in executing workloads on these systems. The reference architecture provides a technical overview of the servers and networking, and explains why the combination of Lenovo products and VMware vSAN software provides best of breed system performance and reliability. The reference architecture describes the workload components, performance recommendations, and best practices of using SAP applications, especially SAP HANA.